Ballin Mundson, owner of a nightclub/casino in Buenos Aires, has his man Johnny run the casino. Mundson's new bride Gilda, turns out to be Johnny's ex-girlfriend, complicating affairs. Tense melodramatic noir with themes of jealousy, infatuation, and mixed loyalties, served with a side plot of Mundson's illegal tungsten cartel involving former Nazis (why aren't there more movies about tungsten?) Rita Hayworth absolutely sizzles. 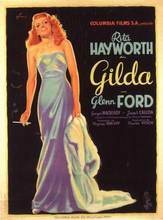 If you enjoy glamour, intrigue, and smoldering passion, "Gilda" is a must see. This classic film noir, set in 1945 Buenos Aires, has all of the above and more. Rita Hayworth, in her signature role as Gilda, is not only breathtaking to look at, but gives a performance that leaves an indelible mark; one that goes way beneath the surface of traditional screen sirens and vamps. She is a woman scorned by her former boyfriend, Glenn Ford, who plays Johnny Farrow, a gambler and hustler from the States. He meets up with Gilda at a swanky nightclub/casino owned by the sinister Ballon Munson, who has befriended Johnny and has hired him to run the club. And, surprise! Ballon has just married the glittering Gilda. The repressed anger and sexual tension between Gilda and Johnny steams from the screen. Glenn Ford and Rita Hayworth were a simmering team, and this movie builds from their chemistry. Also, there is Hayworth's famous "Put the Blame on Mame" number, where she performs a psuedo striptease in another ploy to provoke Johnny. There are plot twists and turns, wonderful costumes and atmosphere, but mostly, the twisted and painful relationship of the two leads that make "Gilda" a fascinating film.